Marilynn Griffith is the author of eight novels including the Shades of Style series and the Sassy Sistahood series. Her novels have been featured inCharisma Magazine,Black Expressions Book Club,andBlack Issues Book Review. Other credits includeChicken Soup for the Christian Woman's Soul,Cup of Comfort DevotionalsandMomsense Magazine. 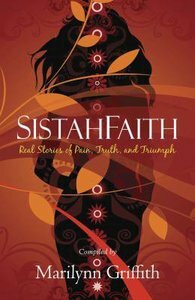 She also serves as president of the recently formed SistahFaith Communications, LLC.Raped at the age of thirteen and a first-time mother at age fourteen, Marilynn was all too familiar with secrecy and shame. But after becoming a Christian and marrying a good man, she now encourages women to lay aside the shame of secrecy and shares a message of hope and healing. - Publisher This collection of poignant stories deals honestly with the African-American female experience and leads readers to hope in a God of new beginnings. This collection of poignant stories deals honestly with the African-American female experience and leads readers to hope in a God of new beginnings. Marilynn Griffith is a freelance writer and conference speaker whose online columns and blogs reach thousands of women each year. She is the author of the Shades of Style series, and Rythmns of Grace and Songs of Deliverance. Marilynn lives in Tallahassee, Florida, with her husband and seven children.